Hedgerow Crane's-bill is a delightful, upright, scrambling perennial which is found on rough, busy hedges, roadsides and waste ground. Quite a hairy plant, it bears its pretty deep-pink flowers (12–18mm) in pairs on long stalks. 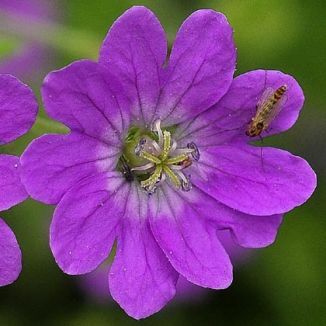 Each flower has five deeply-notched, veined petals, each petal fading to a lighter shade of pink towards the centre of the flower. The bright-green rounded, kidney-shaped leaves are divided (halfway) into 5–7 lobes which are only toothed at their ends. The plant reaches 50–60 cm high and blooms from June to August. This is an introduced plant and it belongs to the Geraniaceae family. I first recorded this plant growing beside the Grand Canal at Lowtown, County Kildare in 2010 when I also photographed it. I am grateful to Dr Declan Doogue, BSBI Vice-county Recorder, County Kildare, for confirming this identification. 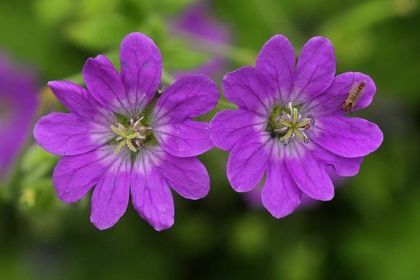 Geranium pyrenaicum was first recorded in Dublin by John Warburton, and appeared in the 'History of the City of Dublin' (1818) by the aforementioned, Rev James Whitelaw and Rev Robert Walsh.